At the Chihuly Garden and Glass, Dale Chihuly takes his work beyond traditional indoor gallery presentations creating elaborate installations that flow on floors, walls, ceilings and the outdoors. We were welcomed into this unbelievable exhibition that explores the inspiration and influences of Northwest artist Dale Chihuly with kindness and independence. What do I mean by this statement? Well, as a photographer I want to be able to explore and capture images without supervision and interruption. You have complete leisure and freedom here to roam to take in all this majestic beauty and culture. The artwork in the Exhibition Hall reveals how he pushed the boundaries of glass as an art medium in concept, execution and presentation. In the Garden, four monumental sculptures and other installations rest among a rich backdrop of trees, plants and flowers. The Glasshouse, a 40-foot tall glass and steel structure, was inspired by Chihuly’s appreciation for conservatories and includes a 100-foot ong suspended sculpture. This exhibition included both indoor and outdoor spaces and the Glasshouse…Oh, be still my heart. The beauty and vision of this artist is BEYOND breathtaking and by far will become one of Seattle’s best landmarks in the future. I can’t recommend this enough to YOU my friend. Put Silica Gel Packets in each compartment of all your camera gear bags. This will absorb moisture, preventing damage to your products. Where do you find these small white packets you might ask? In all most everything you purchase! So start looking for them and put them to good use. Did you sigh more for the indoor or the outdoor sculptures? If this is one of your first or second visits…we would love for you to join the Pride in Photos family. Just fill in your name and the inspirational posts will come right to your inbox. How fun is that? Your photos are outstanding! I hope to get to Seattle to see this before long. A local museum In Corpus Christi has one of his pieces but I can’t imagine a garden of them! Thanks for visiting my blog recently. Your work is inspiring! I love that lavender glass. I haven’t seen that before! Such yummy colors and shapes! And such a joyous and beautiful link! Simply amazing – I’m lost for words. Beautiful photos and of course great artwork! I’ve seen a few of his work displayed in hotels in Singapore and I can just stand there in awe! Amazing work! Thanks for sharing and for dropping by. Such creative stunning glass art! Especially love the ones featured in the last photo! Amazing! That is just incredible. What beautiful photos of some amazing art. So incredible. I saw this exhibit last year in Boston, It was absolutely amazing! we were in St. Louis at the Missouri Botanical Garden. 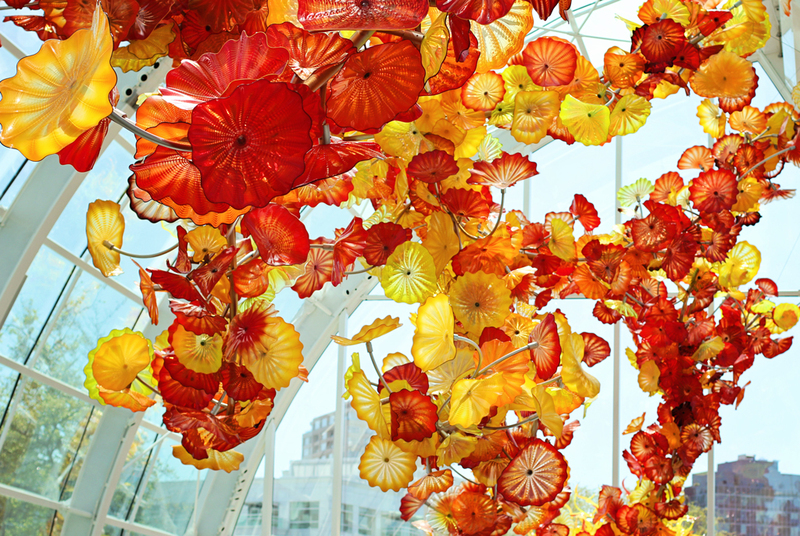 Chihuly’s sculptures are everywhere — and so joyous to behold. A master craftsman. love the photos you posted. My son and I recently went to a concert at Abravanel Hall in Salt Lake City. They have a Dale Chihuly piece in the lobby called, “The Olympic Tower”, or The Red Tower. It’s beautiful but I kept thinking how horrible it must be to dust! What beautiful pictures! I would love to have the first glass art – just gorgeous! These glass works of art are incredible. I especially like incorporating the glass into the garden scape. The colors and shapes are simply…BREATHTAKING! Wow, that’s really awesome and looks so attractive. Normally glass art works looks so beauty and good collection of photos. WOW, you’ve taken such interesting photo’s of their exhibition Laurie. I love the purple garden spheres a lot. The last photo reminds me of the lighting in the lobby of the Bellagio in Vegas. Very pretty. It was so beautiful…breathtaking really. Chihuly is truly amazing! I’ve seen his work in several places. But the most amazing was a major installation at the Desert Botantical Garden in Phoenix a few years ago. Yes, his work is amazing…I just didn’t realize how much his influence is all over the united states. 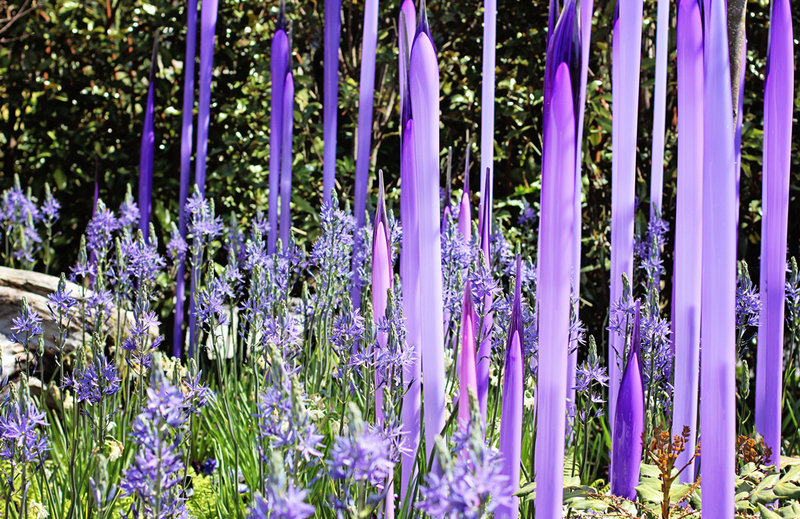 I’m such a fan of Chihuly — these photos are gorgeous — thanks so much for sharing. This is so wonderful! 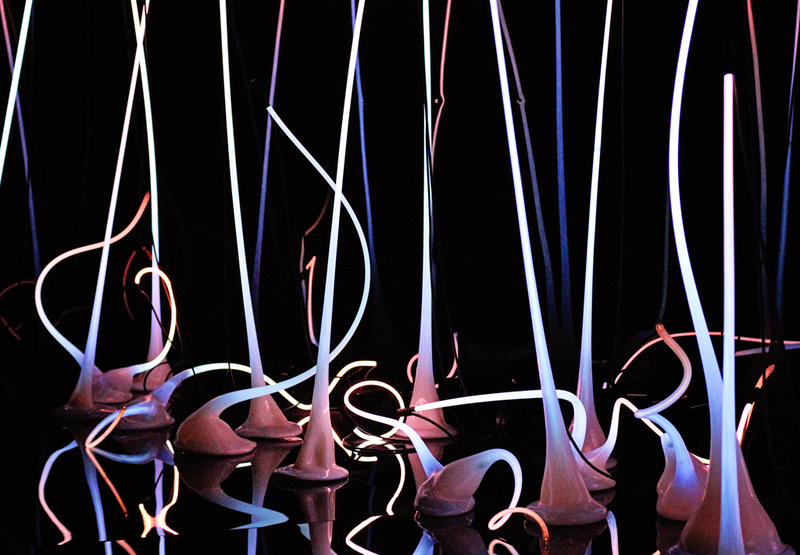 Your photographs – Dale Chihuly’s art work. He says he wants people to be “overwhelmed with light and color in a way they have never experienced.” I’d say mission accomplished! – I was through your post! It’s all beautiful! I’m a new follower. Beautiful Laurie! I really LOVE the light green glass image. The composition is perfect for those tendrils. That last one is breathtaking! Love this! I grew up in Tacoma in the 70’s and it seems like we were routinely subjected (at school) to videos of Dale making glass. It got old & I took it for granted. Either his work has evolved into something I love, or I have evolved into someone who loves it, now. Either way: your photos are amazing and this looks like it was a great trip! Really? This is an amazing story! I was never subjected at school with any kind of art..sigh!! thanks for sharing this tidbit with me. Absolutely beautiful shots!!!!! I love them…They are magical!!!! My congratulations! Wow, those glass sculptures are stunning! Amazing work of art. And superb pictures, wow. A colorful presentation. Most of my ooohn’ & ahhhn’ goes to the outdoor pic! These art work images are beyond gorgeous! Thanks Laurie. 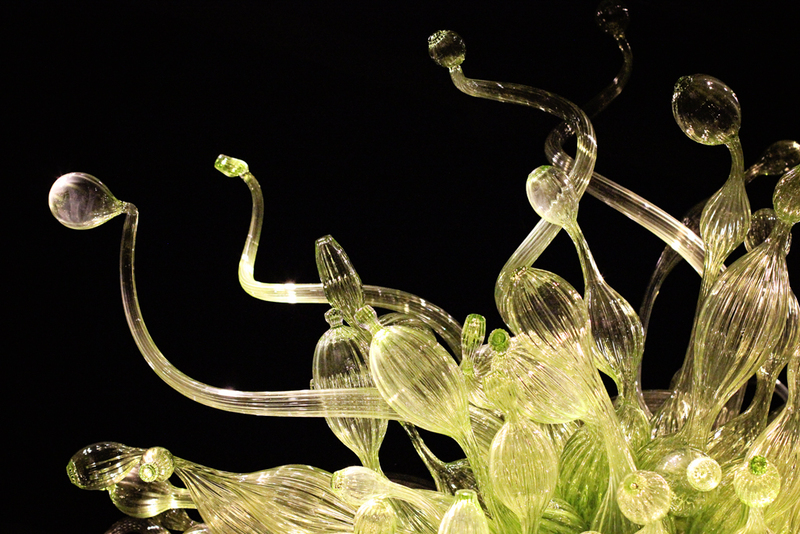 I love Dale Chihuly’s work and you have captured it exquisitely Laurie. Oh you know about Dales Chihuly’s work? Can you believe I didn’t till last week!! I feel so blessed I was able to observe his work LuAnn. Wow, this must be amazing in person!! Thank you…can you imagine having this talent? Swoon. This is just beautiful, plain and simple! What lovely delicate creations. You photographed them well. 🙂 Thanks for sharing. Wonderful images of such beautiful artwork, Laurie! Usually I don’t struggle with adjectives to describe something, but I am at a total loss to express how beautiful I think these pieces of glass work are and what talent it must take to create them. Thank you very much for sharing these photos with us. They are spectacular. Ooooh! I Just LOVE the glass – and the colours! Fantastic! I would have loved to have seen his exhibit – I have a photo I took of his Vegas ceiling sculpture on my sidebar – his work is truly amazing! 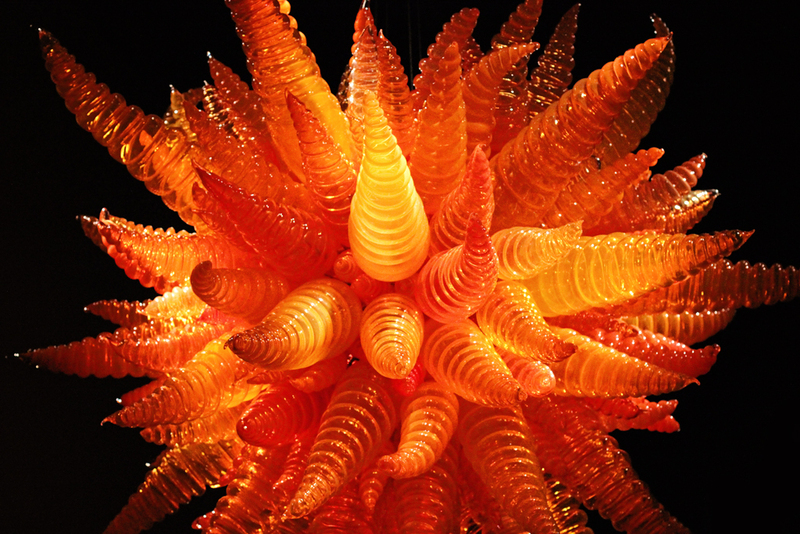 Chihuly’s work is simply breath-taking!! What a wonderful exhibit to see! I am a sucker for a Chihuly exhibit. Here in Dallas the arboretum played host to his work for about 8 or 9 months. I went to see it several times and spent hours shooting the pieces from several angles and perspectives. My favorite – Float Boat. Simply breathtaking. Silica gel packets – awesome idea! I have never thought of that… thanks so much for the tip. I will definitely try it out. GORGEOUS photos as always! 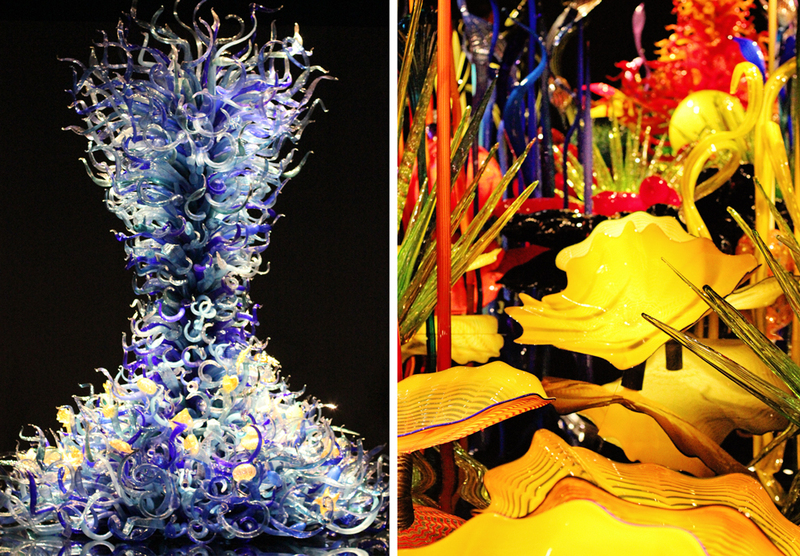 Chihuly came to Boston a few years ago – one of my favorite posts on my blog! Love his work. Thanks for posting. I’ve seen glass sculptures in Newport, R.I. but these are magnificient! Incredible, fantastic and beautiful sculptures!! I have seen glass art like this when I was in Atlantis in the Bahamas. Simply amazing on what they can create with glass! Beautiful photographs! Absolutely stunning sculptures Laurie, thanks so much for taking us to see that incredible work. I have seen some of his installations in Las Vegas, truly breathtaking. Love the silica gel tip too, thanks!